Very rare assembled set of ten hepplewhite carved and inlaid shield back dining chairs, having molded backs with serpentine crest rails, centering five shaped slats with fan inlays within molded shield frames above over-upholstered seats with string inlaid front legs and stretcher bases. 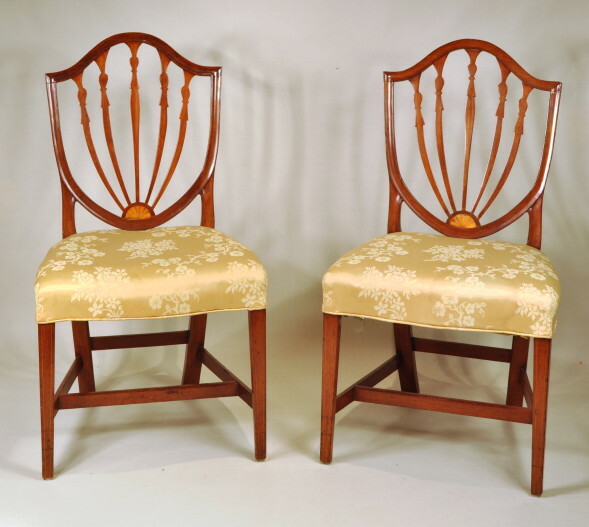 Three original chairs and seven well executed bench made copies of original chairs by Stone & Alexander, Boston, circa 1790-95. See plate 31, pp 86-87, Montgomery, American Furniture Federal Period. 38" high, 21" wide, 17" deep.